While having lunch with an acquaintance recently, she told me that she has instructed her boys (she has two sons) to stay away from all girls, because they are nothing but trouble. As the mother of three girls, I took offense to this comment and told her that she couldn’t possibly make such a sweeping statement and that I certainly didn’t think my daughters were nothing but trouble. My friend went on to clarify saying: вЂњI tell the boys that all girls are trouble, except for the girls who play sports. Since my three daughters are all competitive soccer and hockey players, I suppose this statement was designed to make me feel better, and I’m sure that my girlfriend meant what she said. 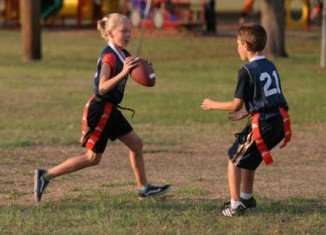 Why are girls who play sports (competitive, not house league) regarded differently by other parents and by, apparently, boys of the same age? What makes an athletic girl less tiresome and bothersome than a girl who doesn’t do any high level sport? Last weekend I spent two days watching my middle daughter play in a soccer tournament. Four games in continuous cold, rainy weather. Although I suspect this makes me a less than perfect Mom (if I ever entertained any ideas that I was anything close to perfection), I was hoping inwardly that the team would lose so we could go home and I could eventually feel my fingers again. I envied my friends who had lovely weekends despite the weather, cozy inside their homes and malls and restaurants while the parents of my daughter’s team (and the players themselves) froze. I revisited the conversations I’ve had with other parents who declared I was crazy for putting my daughters in competitive sports. When my oldest daughter played soccer competitively for the first time, I encouraged a friend to have her daughter try out as well. Her response was if you are crazy enough to give up your summer sitting at a soccer field, then that’s your problemвЂќ. Well, it certainly is! So why do I do it? And would I change anything? My life is full of hockey arenas, soccer fields, homework and music lessons. I could easily unburden myself by not allowing my girls to play hockey 4 or 5 times a week or soccer the same amount. We could entertain more. We could have gone on that trip to Disney that got put off because the hockey team made it to the city finals instead of getting bumped out in the first round like they were supposed to. I wouldn’t have to be wet. Or cold. I would be richer also! We could lounge around. We could relax. I don’t believe I am crazy, and neither does my husband and although I occasionally wonder about my girls, I think they’re pretty sane on the whole as well. They play sports because they love them, and we allow them to play sports because there is nothing more exhilarating, nothing more satisfying or rewarding than seeing our daughters excel. The confidence the girls have is huge. The decisions they make, the things they talk about, the friends they have, the respect they earn from their peers (especially the boys) and the level of fitness they have achieve is way more important than lounging. A relaxing cup of coffee at home in my pyjamas can’t hold a candle to the satisfaction of watching my daughter win a semi final game (despite me often wishing otherwise) and moving on to the finals of a tournament. Seeing the girls come together, encourage each other and the sheer joy on their faces when they cheer each other on cannot compare to Disneyland. It cannot compare to a bigger bank account. And the frozen fingers? There is always a Dad or Mom nearby who is a doctor or nurse to make sure we don’t permanently damage our digits! And as far as the boys, well, as my eldest daughter told me after playing soccer at recess with they them, That Billy? Heв’s actually pretty fast. I need to keep an eye on him. Don’t worry, he didn’t score.вЂќ It doesn’t get any better than that!